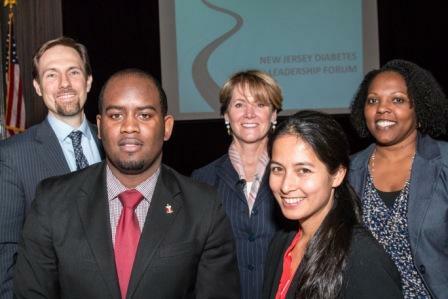 As a student in the Center for Health Law and Policy Innovation at Harvard Law School, I was fortunate to have the opportunity to attend the New Jersey Diabetes Leadership Forum in Trenton, New Jersey on March 27, 2014. 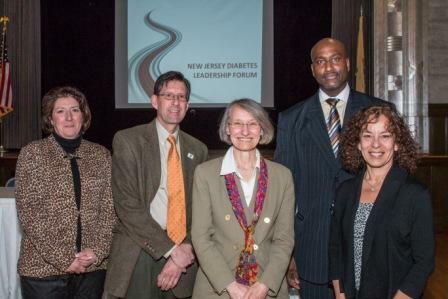 The event featured the release of the Center’s 2014 New Jersey State Report: Providing Access to Healthy Solutions (PATHS) funded by the Bristol-Myers Squibb Foundation in an effort to address type 2 diabetes in the state. 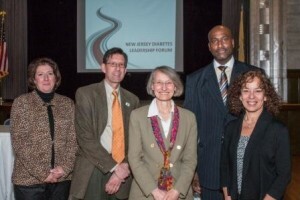 The Forum featured two panels aimed at presenting what is currently being done in New Jersey to improve the type 2 diabetes situation in the state in addition to opportunities for improvement and ways to work together to find a solution. The first panel, which took place in the morning, was devoted to discussing the current initiatives and programs that different cities and counties within New Jersey have implemented to promote health and wellness. From left: Panelists Mark Humowiecki, Charles Brown, Kim Fortunato, Elizabeth Reynoso, and Dr. Kemi Alli. Each panelist presented what their organization is currently doing for individuals in New Jersey to help improve their health and physical activity. First, Charles Brown of the Voorhees Transportation Center at Rutgers University discussed Complete Streets, Safe Routes to School, and other programs to make it easier and safer for people to walk and cycle through their communities. One of the programs that stood out to me was the “open streets” program called the “New Brunswick Ciclovia,” which opened up streets to pedestrians and bikers and closed them to drivers. Over 4,000 people attended Ciclovia in New Brunswick on October 6, 2013 and the event allowed individuals to play in the streets and see new stores, providing the opportunity both for physical activity and exploration of the community in which residents live. According to Mr. Brown, more than 50% of the Latino community of New Brunswick participated in the event. There are additional Ciclovia events scheduled for May, July, and October of 2014. I think that the Ciclovia events are a wonderful place for cities in New Jersey interested in making an impact on obesity and diabetes to start. These events not only provide the opportunity to individuals who might not feel as though their neighborhood is safe to play and be active outside to explore their communities, but also allow them to partake in events with other individuals who live around them to be active and healthy together. By implementing similar open streets programs in other cities in New Jersey, individuals may start to become more comfortable in the communities in which they live while having the opportunity to walk, run, or bike without fear of oncoming traffic. Another panelist from the first panel who described a program that really stood out to me was Kim Fortunato, the Director of Campbell Healthy Communities at Campbell Soup Company. She discussed the strategy areas of the Campbell Healthy Communities Initiative, a $10 million corporate program aimed at reducing childhood obesity and hunger in Camden, New Jersey. One program focus has been on improving food access in Camden with the addition of healthy foods and cooking demonstrations at corner stores to help improve nutrition in Camden. The initiative funds about thirty healthy corner stores in the city. I think that taking action and going into the corner stores in Camden is a wonderful idea, since a lot of the residents of Camden rely on these corner stores for the majority of their food needs. By working with these stores to stock healthier options and providing the tools that individuals need to be able to prepare healthy foods, this initiative is making a real difference in the community. The Campbell Healthy Community Initiative is also focused on nutrition education through family cooking classes. Similar to the cooking demonstrations being provided in the corner stores, cooking classes for families are also an important step in not only providing healthier options to individuals to help lessen the obesity and diabetes epidemic, but also in implementing the healthy options in the home. The family cooking demonstrations can really provide a way for individuals to learn more about healthy food preparation in a fun, interactive way that can help individuals and their families lead healthier lifestyles. From left: Panelists Teresita Lawson, Bill Lovett, Francine Grabowski, Darrin Anderson, and Dr. Rina Ramirez. The second panel was about improving the diabetes prevention and treatment programs in New Jersey that provide access to key services. Darrin Anderson, the State Deputy Director of the New Jersey Partnership for Healthy Kids and the Associate Executive Director of the New Jersey YMCA State Alliance, discussed the New Jersey Partnership for Healthy Kids, whose goal is to evaluate and improve the environment in which New Jersey children live. He noted that without changing the environment that kids are living in, which is often “contaminated,” it will be impossible to make a marked impact on their health and physical activity. This idea really resonated with me because for individuals struggling to change their lifestyle to become healthier people, being constantly faced with temptations to choose less healthy options would be incredibly difficult. If instead communities were more supportive of healthy lifestyle changes, then perhaps children could have an easier time getting more physical activity and making healthier choices in terms of nutrition. Mr. Anderson also discussed the need to create School Health Councils to improve the climate of schools to cultivate healthy and active students. He spoke of the importance of maintaining a positive atmosphere in schools for students when working towards better health. By engaging teachers, faculty, and school administrators in the process of building a healthy, active school community, students will hopefully learn the skills and ways of life most conducive to being healthier individuals. Hopefully these steps will help to reduce the incidence of childhood obesity and diabetes in New Jersey. Additionally, Teresita Lawson, a Clinical Pharmacist at the Zufall Health Center, and Dr. Rina Ramirez, the Chief Medical Officer at the Zufall Health Center, presented findings from their study of the Zufall Health Center’s integration of pharmacists into coordinated care teams through a program called Project IMPACT Diabetes. Evidence from this project showed that clinical pharmacy services, including face-to-face encounters and frequent follow up with patients, yielded better health outcomes and improved levels of cholesterol and blood pressure after only one year. However, because pharmacist visits are not a billable service, the program’s sustainability is in question. The lack of insurance coverage of pharmacist visits is a potential barrier to the future implementation of similar coordinated care integration. Additionally, while evidence of the program’s success in such a short period of time is promising, it will be interesting to see if there are additional longer term impacts of adding pharmacists to care teams. The panels were incredibly enlightening and each panelist’s presentation laid the groundwork for possible collaboration and change in New Jersey, which was exciting and motivating to all of the attendees, including myself. I really enjoyed hearing about all of the different programs currently being run in New Jersey to help make residents healthier and to combat the diabetes epidemic in New Jersey. I am very much looking forward to seeing what is accomplished in the state in the coming months and years to decrease the rates of obesity and diabetes in New Jersey.